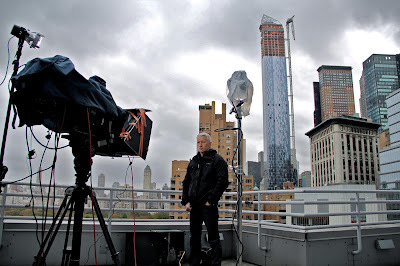 WATER, WATER EVERYWHERE: Randi Kaye reports from Belmar, N.J.
Anderson Cooper anchored the 2:00 - 4:00PM ET hours of CNN's Newsroom again today, from the balcony of the Time Warner Center. Joining Anderson in the coverage were Jessica Yellin; Candy Crowley; Brian Todd in Hoboken, N.J.; Dr. Sanjay Gupta; Michael Holmes in Toms River, N.J.; Chad Myers; Joe Johns; Benn Srauss (CEO, Climate Central); Bob Van Dillen (HLN); Deb Feyerick; Brooke Baldwin; Sen. Robert Menendez (D) New Jersey; Wolf Blitzer; John Avlon; Paul Ballew (Fromer Adviser, Federal Reserve); and Jason Carroll. * New Jersey damage is "overwhelming"
*Thousands trapped in Hoboken, N.J.
Anderson Cooper anchored the 2:00-4:00pmET edition of CNN's Newsroom. He anchored from a balcony off the Time-Warner Center and it was a full two hours of Hurricane 'Sandy' coverage. 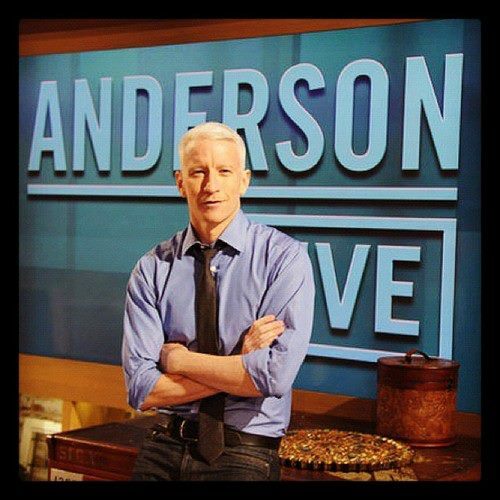 Anderson spoke with various CNN anchors, reporters and correspondents, elected officials and experts as well as showing footage from iReporters. * Sandy hits Asbury Park, N.J.
* Sandy Batters New Jersey Coast, Area's congressman describes "catastrophe"
Blogger's Note: Today's show seemed to be one of those "canned" shows Anderson had pre-taped for a situation like today. The segment with Cesar Millan was a segment apparently taped the same day as his previous appearance, when Anderson brought Molly to work. 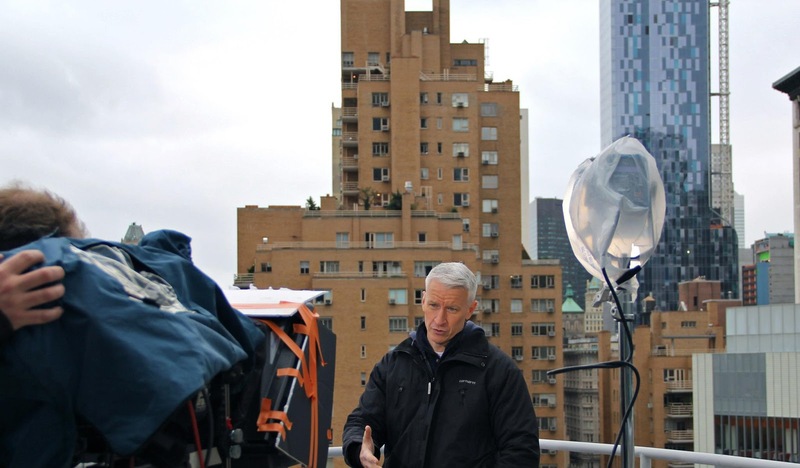 Anderson also anchored the 2pm to 4pmET edition of CNN's Newsroom. We'll be posting that shortly. Anderson Cooper was in Asbury Park to cover Hurricane Sandy with meteorologist Rob Marciano on Monday evening. Broadcasting was sketchy at best in the 8 PM hour and much of his reporting and interviews were done by phone with previously seen CNN storm video playing on screen. Included in the program were Ali Velshi in Atlantic City, Chad Myers at the weather maps in Atlanta, Gary Tuchman from Rehoboth Beach in Delaware, Ashleigh Banfield in Tribeca, Jason Carroll in Lindenhurst and David Mattingly in Connecticut. 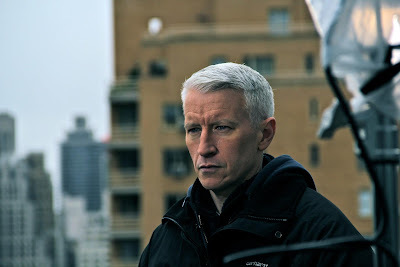 The syndication arm of the Warner Brothers studio has decided that there will not be a third season of “Anderson,” the daily talk show hosted by Anderson Cooper. Citing disappointing ratings, a studio executive, who insisted on not being identified because the studio had planned no official release on the decision, said on Monday that the entire talk television market has been struggling to build audiences. 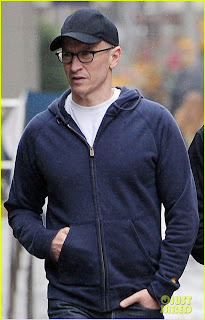 Mr. Cooper’s show, which is produced by Telepictures, will end after the summer of 2013. The executive spoke because some of the stations that have been carrying Mr. Cooper’s show have begun making feelers about replacement shows, and the news was certain to leak out through one of them, the executive said. The decision was not a reflection of any lack of faith in Mr. Cooper, the executive said, but an acknowledgement of the business realities in daytime talk television. The studio “could have renewed the show but could not create a viable economic business model to move forward,” the executive said. Even Katie Couric’s much anticipated new talk show has not yet emerged as a bona fide hit, the executive said. And new shows with other hosts, including Jeff Probst and Ricki Lake, have fared poorly. But Mr. Cooper, who is also a mainstay in prime time on CNN, had been expected to be a star in daytime talk when his show started last fall. After one year with sub-par ratings, the studio and Mr. Cooper instituted a series of changes including stressing same-day tapings as often as possible to deal with breaking subjects, and a new location for the studio. Mr Cooper was on assignment for CNN in New Jersey Monday, covering Hurricane Sandy. 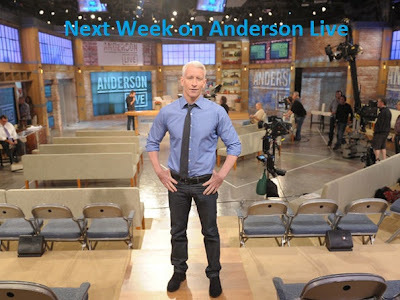 Warner Bros.' Anderson Live!, which was retooled this fall to try to keep it on the air, will end its run after this season, Warner Bros. executives told stations starting on Friday and executive producer Terence Noonan told the staff this morning. The show, which stars CNN anchor Anderson Cooper, will remain in production through March and stay on the air through its second season. "I am very proud of the work that our terrific staff has put into launching and sustaining our show for two seasons," said Cooper in a statement. "I am also grateful to Telepictures for giving me the opportunity, and indebted to viewers, who have responded so positively. I look forward to doing more great shows this season, and though I'm sorry we won't be continuing, I have truly enjoyed it." "We are extremely proud of Anderson and the show that he and the entire production team have produced," said a Warner Bros.' spokesman also in a statement. "While we made significant changes to the format, set and produced it live in its second season, the series will not be coming back for a third season in a marketplace that has become increasingly difficult to break through. We will continue to deliver top-quality shows throughout next summer." Next season, Warner Bros. will roll out Bethenny, starring Real Housewife and Skinnygirl Bethenny Frankel, to stations across the country, with the Fox-owned stations serving as the launch group. Thursday was the beginning of 'Fall Sweeps' and as we said last week, that got us thinking about Anderson's beginning in the daytime talk genre. 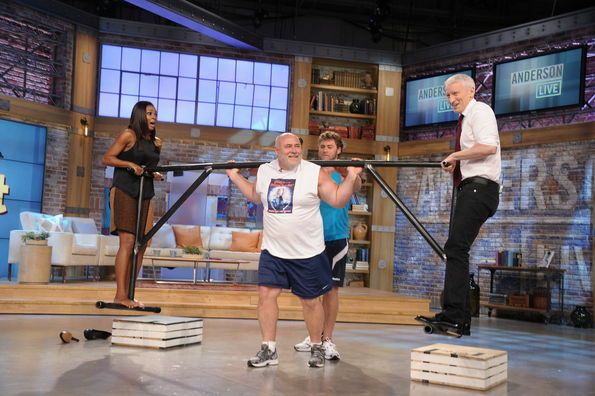 We posted most of his Live with Regis & Kelly co-hosting appearances last year, but in cleaning out the 'ATA vault', we came across a few that we missed at the time. Today's installment is again when Anderson was filling in for Regis, who was out for heart bypass surgery, and aired on March 14, 2007; the day after last week's installment. In the host chat topics ranged from get well wishes for Regis, to American Idol, Anderson's upcoming 60 Minutes piece on Simon Cowell, Anderson's lack of singing talent, Star Jones, Anderson on the cover of 'Men's Journal and Kelly's photo shoot for the TV Land Awards. Wednesday, October 31: Anderson's Halloween Spooktacular with Co-Host Kristin Chenoweth, Creepy Crawly Halloween Treats with Chef Andrew Zimmern (Travel Channel's 'Bizarre Foods') and Mommy Ghost Hunters: Two Suburban Moms Go Searching for Ghosts. Disney-ABC's Katie hit its highest single-day rating thus far, a 2.3 live plus same day national household rating on Columbus Day, Oct. 8, up 35% from the prior week with a show on the after-life, featuring TLC's Long Island Medium Theresa Caputo. Katie was up for the week as well, adding 12% to a 1.9 in the week ended Oct. 14. That's the show's best performance since debuting at a 2.0 in the week ended Sept. 16. Among daytime's key demographic of women 25-54, Katie improved 10% to a 1.1. NBCUniversal's Steve Harvey, the second-highest rated rookie, remained steady at a 1.3 in households and grew 11% among women 25-54 to a 1.0. CBS Television Distribution's Jeff Probst fell back 13% to a 0.7, down the same amount that it gained in the prior week and tying Twentieth's Ricki Lake, which was flat. NBCU's new conflict talker, Trisha, cleared mostly on small independent stations and CW affiliates, rebounded 25% to a 0.5. Turning to the established talkers, CTD's Dr. Phil remained on top despite dipping 7% for the week to a 2.8 in households. Phil also was steady among women 25-54 to a genre-leading 1.6, up 7% from last year. Disney-ABC's Live! with Kelly and Michael turned in a a strong second-place finish with an unchanged 2.6 in households, although up 4% from last year. Warner Bros.' Ellen, on track for its best season ever, grew 4% for the week and the year to a 2.4, tying Sony's Dr. Oz, which also was up 4% from the week before but down 14% from last year. NBCU's conflict talker Maury came in fifth at a flat 2.2. CTD's Rachael Ray remained at a 1.4, tying CTD's The Doctors and NBCU's Jerry Springer and Steve Wilkos, all three of which improved 8%. Note: For those interested; in the same week last season, 'Anderson' had a 1.3 HH rating.